All of our hitch balls are solid steel construction and come in a wide variety of sizes and finishes. All our hitch balls comply with safety specifications and requirements of VESC Regulations V-5 (Vehicle Equipment Safety Commisson has defined a testing method for a hitch that is Class IV or higher. If the hitch passes the various tests it is defined as VESC Regulations V-5 compliant). Which Hitch Ball Do I Need? The hitch ball you need is one with a load rating equal to or exceeding the Trailer Gross Weight Rating. 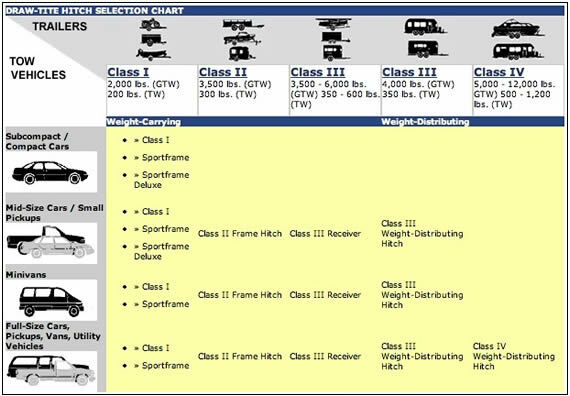 Please refer to the chart below when trying to determine which class of hitch your vehicle can tow safely. Always match your hitch ball to the weight class rating of your towing system. You can only tow as much as the lowest class rated item (hitch, hitch ball, drawbar, etc.) can handle. Class refers to how much weight can be towed. Class I (to 2000 lbs) and Class II (to 3500 lbs) are for light loads. The receiver is a square hole 1.25 inch x 1.25 inch. Class III (to 5000 lbs) and Class IV (to 10,000 lbs) can accommodate much larger trailers such as campers, boats, etc. A Class III/IV receiver is 2 inches square. Data generated in 0.002073 (s) from 6 queries.